NETIO Review 2019: Is NETIO a Good Hosting? NETIO is a hosting provider based in the Czech Republic, offering its users the choice of SSD or HDD shared hosting. The plans come at a premium price point, but the resource allocations are generous. Founded in 2012, NETIO is a hosting provider based in the Czech Republic. It co-locates its servers at the Tier III data center MasterDC Praha in Prague, the Czech Republic. The company actively maintains a Facebook page. Its simple website is available in Czech only. NETIO co-locates its servers in a Tier III data center, MasterDC Praha, in the Czech Republic. It’s always preferable if a host owns its own data center, but it’s great to see it’s Tier III, which means less than 1.6 hours of downtime per year. Also, NETIO commits to maintaining a 99.99% availability rating for its hosting services, although it is not backed up by an SLA. The plans come with either HDD or SSD storage, so you can choose between the cheaper and slower conventional hard disk drives or pay a premium to get disk read / write times up to ten times faster by upgrading to SSD. There are plenty of features for you to develop your websites, such as the usual MySQL databases, FTP accounts, access via the phpMyAdmin tool, as well as less common Cron jobs and remote SQL connections. Oddly, while you can select the version of PHP, it is set by default to the older version 5.6. The situation with beginner-friendly tools is less favourable. 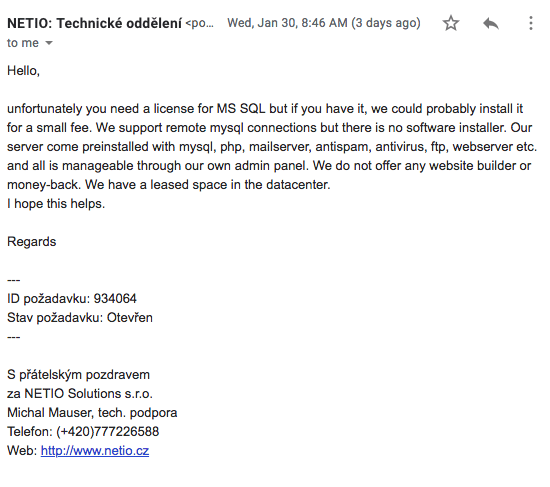 I contacted support, who confirmed there isn’t a website building tool or a one-click installer. This means that these plans may be more suitable for expert users rather than novices to website building. The prices are higher than local and international competitors. Although the resources included are comprehensive, including unlimited domains, mailboxes, databases, and FTP users, a lot of the add-ons are paid, which I found frustrating. For example, if you want to store more than two backup points or have dedicated customer support, you will need to pay more. Plans can be purchased in one, three, six, or 12-month terms. Instead of giving its customers a discount for longer terms, NETIO has instead elected to apply a surcharge for shorter terms, ranging from 5% to 10% extra. Also, while it advertises a 365-day money back guarantee, if you read the fine print, in reality it’s only a 14-day unconditional money back guarantee. Only if there’s poor performance or repeated outages by NETIO within a 365-day period will the web host give you a refund. In my opinion, poor performance should always be refunded, not only if it falls within one year. Support is available by telephone and email 24/7. There’s also a relatively active community forum you can peruse. Email support is pretty fast, though: I contacted support by email on a weekday morning and received a reply answering my question in full on the same business day. NETIO provides Czech-based hosting with your choice of SSD or HDD storage and 99.99% availability. The plans are expensive with no beginner-friendly features; however, with the use of a Tier III data center, support for various versions of PHP, and fast customer service, there’s plenty of value with these plans. Multi-Domain Hosting Available at NETIO! Wondering how NETIO stacks up against other Web Hosting companies? Enter any other Web Hosting company and we will give you a side-by-side comparison.